The students want to protest, yet stay neutral. They're not taking sides. Their slogan is, "Let Us Play." They're hoping for 1,000 people to attend, and that would be cool. But what will they do with them? Without a stand, what's the plan of action? They don't want their lives affected, and some students have likened this experience to having mommy and daddy arguing with the children in the middle. Except they're not little any more. And this isn't mere bickering. If students want to get involved in this pivotal argument, they can't just beg for the arguing to stop because it's interfering with their fun. If they actually want to take an active part in making a different, they have to pay attention to what's being said and choose a side. Refusing to pick a side renders this a protest without a clear path for resolution. Protests don't have any effect if demonstrators aren't crystal clear how things need to change. Look at the difference between the civil rights movement and Occupy Wall Street. The 99% was able to create a huge buzz and generated a mass of involvement which was so exciting and unexpected. But they didn't have a solution, a path to the finish line, and it all just went away. If students just want ten minutes of fame so we can watch them complain a little, then they're on the right track. But to actually have an effect on the world, they have to take a stand. They have to stand up for what they believe is right, and be so very courageous as to say so right out loud. Otherwise it's just a party - or worse. I've heard the term "awareness rally" bandied about on this one, and it's something, but imagine if they would actually protest. They have two sides to choose from, and one of the choices isn't for everyone to stop arguing and bring back extracurriculars. That's just not how it works. Civil rights protesters demanded an end to segregation, not an end to all the arguing. Ending the fight without ending the problem isn't a viable solution. Students have to figure out what their real demands are that will, eventually, have the effect of curtailing strife and allowing them some organized play once more. Here are the choices as I see them. The general media has painted a very different picture. You be the judge. Bill 115 passed into law by a majority vote in parliament. The government involved was democratically elected by the people. Both the liberal and conservative party MPPs unanimously voted in favour of the bill. The NDP MPPs unanimously voted against it. The ayes have it. That's the way the cookie crumbles. Citizens of Ontario elected each of these representatives in fair elections. When they pass a bill into law, the citizens must follow that law. We can't pick and choose which laws to follow. We have to follow them all - like it or not. People who don't like it might want to vote NDP next round. But for now, settle down and get back to work. Bill 115 is a travesty and removes democratic rights so appallingly that it's a blight on our democratic process. Last April 18th, teachers with OSSTF indicated they'd accept a wage freeze, but the government rejected their proposal - possibly because it also included some board reductions and a freeze to new ministry initiatives, or possibly (dare I say) because they were hoping to cause enough conflict to be able to pass a law that curtails worker's rights to this extent. But it's clear that OSSTF didn't have an issue with the wage freeze. Let's make that crystal clear. That's not what held up the contract. This law that passed in September gives the government the right to change anything in our contract at any time without a negotiation review by legislation or review by school boards. They’ve made it so anything they change can’t be challenged by any legal venue including the Ontario Labour Relations Board, a third party arbitrator, or court of law, and the contract they impose can be extended without limit. And if they get away with it with teachers, what stops them from moving on to all areas of the public sector? This is old hat in the private sector already. If a company like Wal-Mart shuts down a store that tries to unionize, many protest even though we don’t have much say in the private sector. We recognize that workers deserve a means to prevent exploitation by management. But now, when our government passes a law that can prevent open, transparent negotiation between management and unions and can ban strike action, something we have a democratic right to protest, some people think it’s wrong to take action. What’s the difference? The government could cut our salary in half on January 1st, force us to teach more classes, and make coaching mandatory. They could increase class sizes and shut down schools. That could be good news for tax-payers, but a huge problem for anybody working in the public sector - and an even bigger problem for education. They've already restricted our ability to choose the best person for the job when we hire new teachers - and timed that action so we'd be too preoccupied to protest it exclusively. This isn't a government that cares about quality education. This isn't a government that is looking out for us. They go for teachers first because we're easy targets - already perceived as lazy and greedy. But union-busting is a frightening course of action not to be taken lightly. The work-to-rule action by teachers is not just to benefit teachers, but all workers in the future including our current students. Students are affected by it all because the only thing we can do to make any kind of an impact is to refuse to do work that's not legislated. We could walk out, but that would hurt students more - affecting their grades instead of their team and club participation. Some have suggested we talk it out, but the government made the rules such that they no longer have to listen to teachers. Ever. Again. When a Wal-Mart closes because workers tried to unionize, the shoppers are adversely affected because they can no longer get the deals they're used to getting. But we don't get mad at the workers for trying to assert their rights. Eroding rights for some puts us on the slippery path towards eroding rights for the many. We're first in line here, and we're doing what it takes to nip it in the bud. The student rally's slogan, Let Us Play, feels embarrassingly frivolous in the centre of a dispute of this magnitude. We're not stopping anyone from playing; we're just no longer giving them the organizational structure and space they need to compete or perform in the same way as their used to. Teachers love being involved with extracurriculars too, and it's all very unfortunate - it really is. But that's all it is. 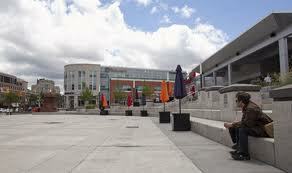 The student rally is happening at Waterloo Town Square. A mall. It's a good public forum, central and spacious. But if they want to effect change, then that venue is empty and meaningless. 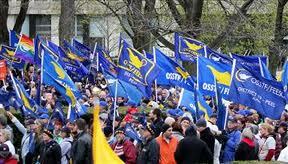 Those that take a pro-government stand, should rally at the OSSTF office. The students with a pro-union/teacher stand should meet at our local liberal MPP's office. But if they really want to get an audience, they need to organize provincially. I remember students missing classes back in 2001 to protest at the Quebec Summit. Half my philosophy class was gone. They organized busses! And that was an event that barely had a personal impact on them. Toronto's much closer, and there aren't barbed-wire fences to get tangled up in. 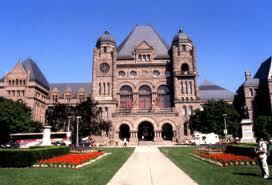 Queen's Park is easy to find, and the provincial OSSTF office is just a ways down the DVP. Take your pick. Protesting is a exciting way to feel involved in a major event. But it's just a facade of involvement if it's without conviction. If students just want it all to go away and get back to normal as soon as possible, then they should tell OSSTF to get with the program already. But if they want to make sure human rights are safely protected by the time they enter the workforce, then they need to have a word with their MPP and Laurel Broten. And be prepared to dig in for the long haul. I guarantee that many of us will celebrate your courage and your passion, even if we disagree with your position. I guarantee I will for sure.